Jesus' idea of salvation centers in his idea of God. His most characteristic description of God is as the bountiful Giver. With a liberal hand God pours out His blessings upon all people. His love is large and generous. He is ready and eager to bestow His gifts. This impulse to give and to bless springs from God's boundless, universal love. Jesus' favorite expression for this aspect of God's character is the term “Father.” As the Father, He loves and blesses all people - even His disobedient and sinful children. He yearns for the lost son and waits and watches for his return; He continues to love those who are indifferent, or even hostile, to His will, and sends His Son to seek and to save them. Salvation means a life corresponding to this character of God. Jesus expressed it by the phrase "becoming sons of the Father" (Matt. 5:45.) Sonship in the Jewish mode of thought denotes moral kinship and likeness. Jesus presented a view of God designed to move the heart to penitence for sin and to gratitude and obedience. He set the highest value on small deeds, if done from love or compassion. 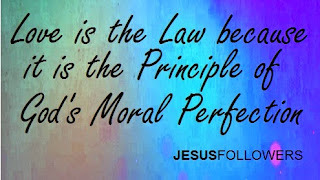 The first and great commandment, which summarizes the whole import of the law and the prophets, is the law of love. In comparison with the requirements of this law, all sacrifices and other religious ceremonies are of little consequence. 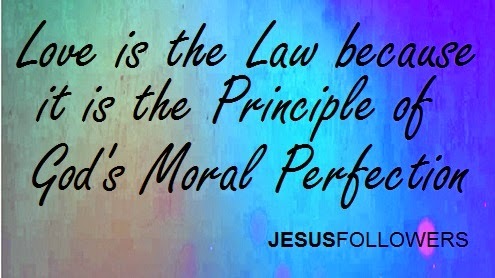 Love is the law because it is the principle of God's own moral perfection. God’s requirements are grounded in His nature. The life of love is the Godlike life, the life of sonship; it makes us members of the Kingdom of Heaven; it IS salvation. This teaching of Jesus does not minimize the requirements of holiness. If the statement of it appears to do so, this is due to the fact that Jesus does not separate righteousness from love, as later thought has done. To him these are never contrasting and rival terms. What, then, must a person do in order to be saved? They must repent of sins and forsake them. The first word in Jesus' proclamation of the Kingdom was, "Repent" (Mk. 1:15). But not only must we repent; we must turn (Mt. 18:3) — turn away from the old life, and in humility and self-surrender take up the life of obedience to God. Our Master’s descriptions of the conditions of salvation are not abstract and formal, but concrete and realistic. It lay within the power of the erring son to forsake his evil life and escape his sinfulness by returning to his Father with a penitent and obedient heart. When one recalls the complicated theological discussions of Salvation, the teaching of Jesus on the subject does seem, in comparison, very simple. That’s because popular theological terminology for the subject is derived more from the language of others than from Jesus himself. Jesus did not analyze the process of attaining salvation, nor define its various steps and stages. He simply pictured the Father's house as standing open, and the Father's heart as ready and waiting to receive the wandering, lost son. Jesus calls sinners to repent. He demands moral purity, humility, charitableness, and kindred virtues, and does not hesitate to require "good works" in one who wishes to glorify the Father in Heaven (Matt. 5:16.) In one place he declares that only one who does the will of God can enter His Kingdom, and elsewhere he prescribes the law of service as the law of that Kingdom. When we further observe that he conceives his own mission as a mission to serve humanity, we realize one of his saving works was to induce us, by example and influence, to live the Godlike life of self-giving, in which our true greatness and glory are found. Jesus saw his teaching and example as saving in their effect upon us. He sought by these to strengthen in us the desires and efforts for a better life - the life of sonship to God. The life of Jesus, with its various expressions of itself in word and act, was a powerful saving agency in his time, and still remains so. The teaching of Jesus gives us no warrant to speak flippantly, as is commonly done, of his "mere" example. Theology rarely takes time to mention the saving power of the personal influence of Jesus. But let us not minimize by silence or by qualifying words what Jesus placed in the very forefront of his message to humanity: the declaration that the door of God's Kingdom stood open before them that they might enter then and there if they would, and that he had come to show them the way. Jesus says: I am the world's light; by me you can know the Father, God's Kingdom is in your midst - by such words as these Jesus announced a present salvation, available at this moment, and himself as the guide to its realization.